Maidenhead United and BCA have signed a partnership agreement to establish the new MUFC Academy Programme from September 2015. The programme offers talented young players aged 16-18 the opportunity to combine high level football with Maidenhead United FC (MUFC), with full time study on a sports related course at BCA in Burchetts Green, Maidenhead. 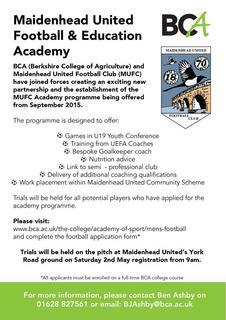 Players will receive a structured coaching programme from BCA Academy coaches and will represent the Maidenhead United Academy Team. Selection for the MUFC Academy Programme will be based on both academic interviews and football trials and is contingent on players being enrolled on a full time study programme at BCA. Students will combine their normal academic studies with a structured programme of training and coaching using the onsite gym and training facilities and will also play competitively in the Development League. Please visit www.bca.ac.uk to find out about the programme or contact Aaron O’Brien on 01628 827539 or via aobrien@bca.ac.uk for further details.